The current theoretical framework that describes elementary particles and their forces, known as the Standard Model, is based on experiments that started in 1897 with the discovery of the electron. Today, we know that there are six leptons, six quarks, four force carriers and the Higgs boson. The list below gives the dates of important discoveries, the names of scientists and laboratories involved, and Nobel Prizes awarded for the discoveries. 2012 The ATLAS and CMS collaborations at the CERN's Large Hadron Collider independently discovered the Higgs boson, which confers mass to other particles. up (u) 1964 Gell-Mann and, independently, Zweig introduce the idea of quarks, the building blocks of composite particles, to explain the classification of particles observed in experiments. down (d) 1968 Physicists at the Stanford Linear Accelerator Center (SLAC) observe the first evidence for quarks inside the proton. Friedman, Kendall and Taylor receive the 1990 Nobel Prize. strange (s) 1951 First observation of kaons (particles containing strange quarks) in cosmic-ray experiments. 1956 Gell-Mann, of the California Institute of Technology, explains the relative longevity of kaons with the concept of strangeness and receives Nobel Prize in 1969. 1964 At Brookhaven National Laboratory (BNL), Cronin and Fitch find that kaons violate the matter-antimatter symmetry (CP violation). They receive the 1980 Nobel Prize. charm (c) 1972 Kobayashi and Maskawa predict the existence of a fourth quark (named the charm quark) and two additional quarks (known as bottom and top quarks) to explain the non-symmetric (CP-violating) behavior of kaons (particles containing a strange quark). They receive a share of the 2008 Nobel Prize. 1974 Physicists at SLAC and BNL discover independently a new particle that contains a new kind of quark, called the charm quark. Richter (SLAC) and Ting (BNL) receive the 1976 Nobel Prize. bottom (b) 1977 Led by Lederman, a group of scientists at Fermilab discover the upsilon, a particle containing a bottom quark and an antibottom quark. top (t) 1995 The CDF and DZero collaborations at Fermilab announce the discovery of the top quark, an elementary particle as heavy as a gold atom. electron (e) 1897 Using a cathode tube, Thomson discovers the electron at the Cavendish laboratory in England. He receives the Nobel Prize in 1906.
electron neutrino (νe) 1956 Experimenters led by Cowan and Reines at the Savannah River plant detect the first neutrino. Reines shares the 1995 Nobel Prize. to 1990s Experimental groups led by Davis and Koshiba are among the first to observe neutrinos produced by the sun and by a supernova. Their measurements of solar neutrinos lead to the discovery that neutrinos have mass. Davis and Koshiba receive a share of the 2002 Nobel Prize. muon (μ) 1937 Neddermeyer and Anderson discover the muon in a cosmic-ray experiment. muon neutrino (νμ) 1962 Scientists at Brookhaven National Laboratory discover the muon neutrino. Lederman, Schwartz and Steinberger receive the 1988 Nobel Prize. tau (τ) 1976 Experimenters at SLAC discover the tau lepton, the first observation of a third-generation particle. Perl shares the 1995 Nobel Prize. tau neutrino (ντ) 2000 Fermilab announces first direct evidence for the interaction of a tau neutrino in a detector. Indirect indications for the existence of this particle existed for more than two decades. photon (γ) 1905 Based on Planck's introduction of quanta of energy, Einstein describes the photoelectric effect using light particles called photons. They are carriers of the electromagnetic force. Planck receives the 1918 Nobel Prize, and Einstein is honored in 1921.
gluon (g) 1973 Gross, Politzer and Wilczek predict that the strong nuclear force, mediated by gluons, behaves like a rubber band: it becomes weaker as the distance between two quarks decreases. They share the 2004 Nobel Prize. 1979 At the Deutsches Elektronen-Synchrotron (DESY) in Germany, scientists report evidence for the gluon, the carrier of the strong force. bosons (W, Z) 1983 Physicists at the European research laboratory CERN observe W and Z bosons, the only force carriers with mass. Rubbia and van der Meer receive the 1984 Nobel Prize. boson (H) 1964 Higgs and other theorists use the concept of spontaneous symmetry breaking to explain why the W and Z bosons have mass while the photon has no mass. 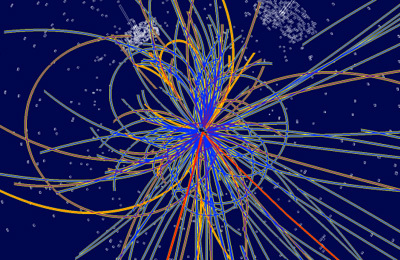 The explanation predicts the existence of at least one additional particle, now known as the Higgs boson. positron (e+) 1931- Examining-cosmic-ray data, Anderson discovers the positively charged electron – later named the positron. He receives the 1936 Nobel Prize. The theory of the Standard Model is intimately connected to the numerous discoveries in quantum physics in the first half of the 20th century. Here are the major theoretical breakthroughs of the second half of the 20th century that were honored with Nobel Prizes. 1965 Tomonaga, Schwinger and Feynman receive the Nobel Prize for formulating the theory of quantum electrodynamics, the most precisely tested theory in physics. 1969 Gell-Mann receives the Nobel Prize for his contributions to the classification of elementary particles and their interactions. 1979 Glashow, Salam and Weinberg receive the Nobel Prize for the unification of the electromagnetic and weak interactions into the electroweak theory. 1999 ‘t Hooft and Veltman receive the Nobel Prize for their quantum formulation of the electroweak theory. 2004 Gross, Politzer and Wilczek receive the Nobel Prize for their contributions to establishing the theory of quantum chromodynamics, the theoretical framework that correctly describes the strong nuclear force. 2008 Nambu receives half of the Nobel Prize for introducing the concept of spontaneous symmetry breaking into particle physics, which led, for example, to the explanation of why some particles have mass and others have not (Higgs mechanism). Kobayashi and Maskawa share the second half of the Nobel Prize for predicting the existence of additional quarks (charm, bottom and top quarks) and how their presence leads to a broken symmetry that explains why matter and antimatter behave differently.